It's not going to be a cake walk for U.S. Senator Pat Roberts. But Roberts will also have to fend off a Democrat in elephant-ish clothing in independent Senate candidate Greg Orman. I don't know a whole lot about Orman, an Olathe businessman. He apparently has plenty of his own money, as I hear he's self-financing much of his campaign. He's launched an 18-stop "Problem Solving Tour" where he plans to detail his Congressional reform plan. The very basics of his reform plan sound good. His four-point reform plan includes enacting term limits, ending Congressional pensions, banning lobbying by former members of Congress, and eliminating leadership Political Action Commissions (PACs). I can get behind those things. I just can't trust a man who won't say with which party he'll caucus if elected. If in Kansas, you're an independent who can't clearly and honestly say, I'll caucus with the Republicans, then I can't vote for Orman. That's a non-starter. 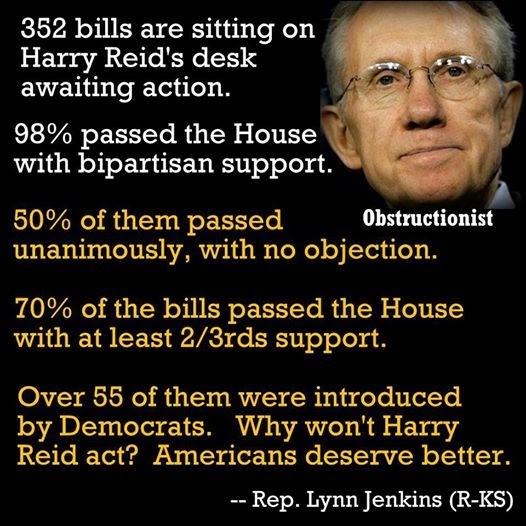 One of the worst things that has ever happened to this country was the vaunting of Harry Reid to U.S. Senate Majority Leader. I don't want to be called jingo-istic, but I truly believe Harry is evil. That isn't something I say easily, but that guy may as well be sporting horns and red spandex.